We wish we would have paid better attention to the Footprints guidebook to Chile when it said, “the Bohemian and slightly anarchic atmosphere of the cerros (neighborhoods) reflect the urban chaos of [Valparaíso] as a whole”. Paying better attention would have better prepared us for the excitement we would be surrounded by for the next few days. We landed in Santiago where we promptly picked up our rental car and, thanks to the knowledge of the rental car agent, picked up some local currency for the toll stations we would encounter on our way to Valparaíso. 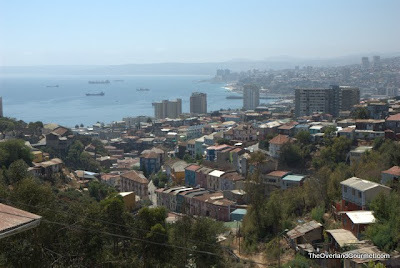 The highways and roads to Valparaíso and Viña del Mar were well marked and easy to follow. The two hour drive took us through the arid landscapes, mountains, tunnels, and vineyards before leading us to the costal metropolis of Valparaíso and Viña del Mar. The cerros of Valparaíso reminded us of the hills of San Francisco combined with the curvy and narrow roads of an old European town. Mix into this some of the most passionate drivers we have ever encountered who communicate with one another through the liberal usage of their horns. Finally, add in the lack of street signs and aforementioned anarchy and you have the perfect recipe for excitement. With the neighborhood and address of the Bed & Breakfast in hand, we began our search. We naively thought the GPS would take us right there, but it was of little help in the winding hills of Valpo. Next, we thought we’d stumble upon the street driving through town; at the worst we could find a map and make our way…ha! After driving through Valpo for over an hour we knew we were in trouble—streets weren’t named and we couldn’t even find the destination neighborhood. Two and one half hours later I finally summed up enough courage to ask a taxi driver to lead us the B&B. After several wrong turns, the taxi driver got us there. I actually don’t feel so bad about getting lost, as it took the cab driver three phone calls to the B&B staff to get us to our destination. The rest of the day consisted of decompressing from our navigation adventures and eating dinner. The host at the B&B suggested a restaurant in a market area. The market was in an area of town where the average Chilean shopped. Even though Chile is touted as being the most economically blessed country in South America, most Chileans are very poor according to US standards. Before dinner we toured the market area where the goods sold by street vendors were organized by into separate areas. Need toilet paper, cell phone chargers, or other housewares? Go to Rawson Street. Want produce? Yungay Street is your place. Meat, seafood, and legumes are found inside Mercado Cardonal. On the second floor of Mercado Cardonal are several restaurants. We visited El Rincón de Pancho. Beau had some sort of fried fish and rice and I ordered Paila Marina. Before our dishes arrived we were served a mild tomato/onion/cilantro salsa and bread. We thought this was an interesting restaurant-specific appetizer but later learned that the bread and salsa precedes almost every restaurant meal. One of my first gringa mistakes was confusing Paila with Paiella. Although both are delicious in their own right, it is a bit shocking to get a bowl full of seafood soup when you are anticipating a savory rice dish with seafood on top. The paila marina contained perfectly cooked scallops, shrimp, fish, calamari, and an assortment of shellfish in a mild seafood broth. The big surprise about this dish was the preparation of the shellfish. In most markets and restaurants in the States, the shellfish are fed cornmeal so they expel all of the grit and green stuff prior to being consumed….not at this restaurant! For anyone who knows me I am not one to turn down seafood let alone shellfish, but I left the restaurant having eaten only one gritty and goopy bivalve. Using the tracks feature of our GPS, we easily and safely returned to the B&B where we hoped to turn in early for the night after all of the stress and excitement we had during the day…this is when we learned that Chileans stay up VERY late. It was 11:00pm and the children were still outside playing in the street, dogs were barking all over the town, and there was large moving truck driving around the hilly cerros with several men playing steel drums on the back. It was actually very calming and soothing to hear people having fun and enjoying themselves. At around 2:00am things finally settled down.